Since the original posting of my article, Thank You Lord for Saving My Soul, on January 14, 2011, it has been read by internet users thousands of times. I suppose that is because a lot of lives were positively affected by this little song some time earlier in their lifetime. Or it could be that the song reminds folks of a special time in their lives which was very important to them. I am pleased that so many people have found the article worthwhile, especially around the Thanksgiving holiday which occurs in November in the USA. With this update, I am providing some additional background on the songwriters and their ministry. For convenience I first present the original article. Special Note: October 19, 2015 – This article was originally posted on January 14, 2011. After a number of contacts with direct descendants of Seth and Bessie Sykes several corrections and updates have been included and are shown below in red. Thy great salvation so rich and free. The tune is simple and the words are easy to sing. But I’m not sure that I ever understood how profound these words really are. I recall learning this chorus in Vacation Bible School in the late 1940’s or early 1950’s. Later on I know that we regularly sang it in our youth group. And even later, our church would use it as part of our worship service, particularly after someone came forward to give their life to Christ. Campaign Photos of Seth and Bessie Sykes provided by Eva Sykes Campbell, daughter of Seth and Bessie. Seth and Bessie lead children to sing songs of the Savior. Note the small folding organ that Bessie is playing. This was taken at Largs Ayrshire – they held children’s seaside services there for 9 years 1941 – 1949. Source: Eva Sykes Campbell, daughter of Seth and Bessie Sykes. The Sykes home base was located in Glasgow, Scotland the third largest city in the United Kingdom. 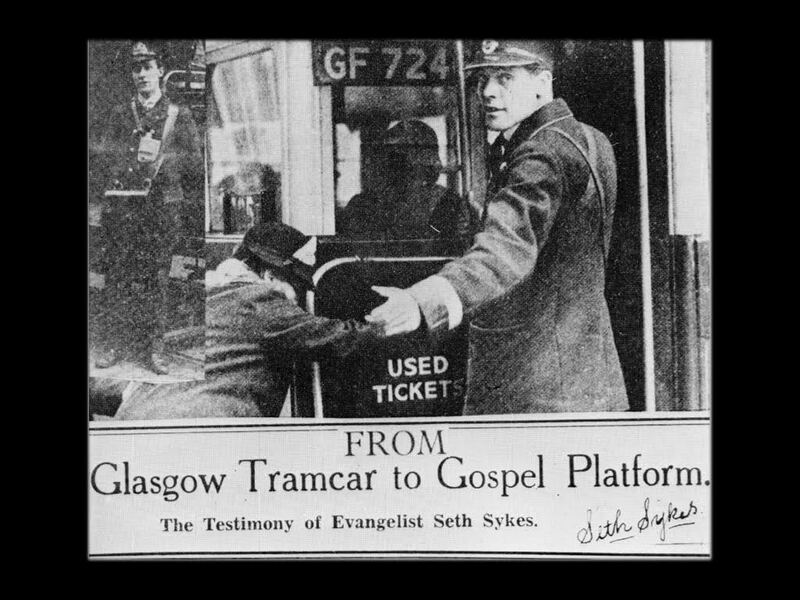 Seth Sykes began his career as a conductor and motorman for Glasgow Corporation Tramways. He also served as Secretary for the Tramway Christian Association where he was allowed to hand out Christian literature and Bibles. In 1929 Sykes left his job and along with his wife became a full-time traveling evangelist. 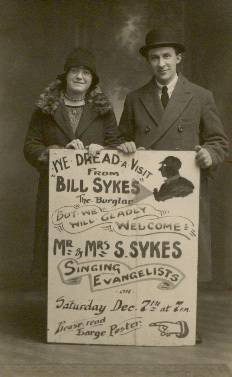 The Sykes were somewhat like today’s media Christian innovators in that they used lantern slides and rousing hymns played by Bessie on a small, folding organ to gain the full interest of their crowds. Seth’s sermons led countless people to Christ and this hymn was most assuredly sung as a regular part of their services. The following description of the story behind Thank You Lord for Saving My Soul is taken from “A Great Little Man, A Biography of Evangelist Seth Sykes”, copyright 1958, written by Seth Sykes, Jr. and Bessie Sykes. Reflection: I thank God for giving … yes GIVING … me my salvation. There is no way I can take it for granted. It is God’s free gift. I simply must tell others what Jesus has done for me. I pray for the fervor that the Samaritan woman at Jacob’s well had for telling others about Jesus after she encountered her Messiah. She left her water pot and ran back to town to tell everyone about what Jesus had done for her. John records the results of her testimony in John 4:39 (NIV) – “Many of the Samaritans from that town believed in him because of the woman’s testimony, ‘He told me everything I ever did.’” Her message was simple. She didn’t have Biblical training or a special calling. All she did was tell others what Jesus had done for HER in her own words. That’s all that is required. Tell others in your own words what Jesus has done for you and let Christ do the rest. I wonder if Seth and Bessie Sykes knew what an impact their simple hymn and chorus would have on future generations. I, for one, am indebted to them for this wonderful hymn and chorus. Perhaps the full lyrics of the hymn would inspire you to tell others what Jesus means to you. Here’s a link to HymnPod to play and sing along with the hymn “Thank You Lord for Saving My Soul.” Click on the link and then scroll down to the player and click on the start button. Because I know He’s mine. Ephesians 2:8-9 (NIV) For it is by grace you have been saved, through faith—and this is not from yourselves, it is the gift of God— not by works, so that no one can boast. 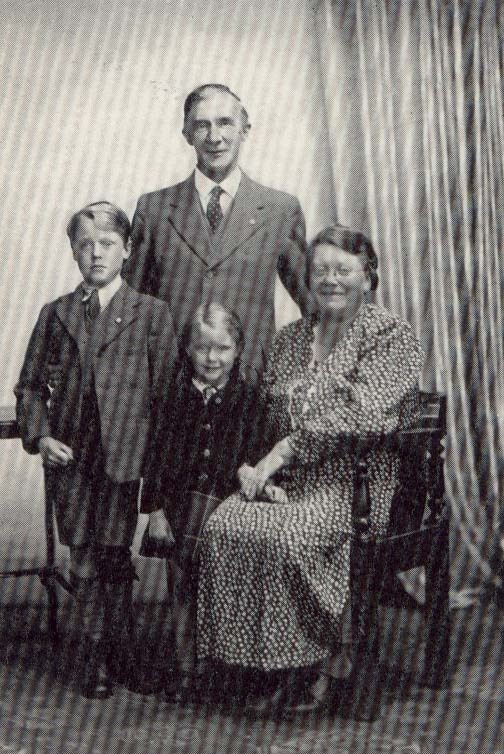 Seth Sykes Train Conductor – Source Eva Sykes Campbell, daughter of Seth and Bessie – According to Mrs Campbell, Seth is the conductor in the upper left corner of the photo. Recently I have come upon additional information about Seth and Bessie Sykes and want to share it with those who continuously search the internet for “Thank You Lord For Saving My Soul” and happen upon my blog. It is often helpful to explore the story behind a hymn to better understand the purpose of the songwriters in penning it to begin with. Figure 1. provides a picture of Seth Sykes in his full Glascow Corporation Tramway uniform. The picture was most likely taken prior to 1929 when Seth left his full-time job at the Tramway so he and Bessie could spend full-time on their already blooming ministry. Seth was a slight man with a big heart for Jesus. Seth and Bessie never looked back after they started their full-time ministry. They spread the word of the Lord wherever they went. They wrote Christian hymns and even published songbooks. Announcing services led by Seth and Bessie Sykes at the Belfast City Mission. 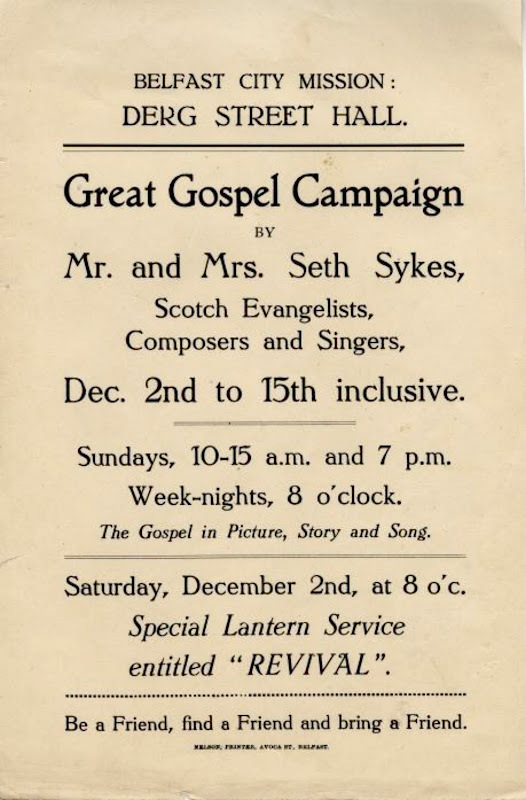 A poster announcing a “Great Gospel Campaign” led by the Sykes. Notice that the services were held daily for two full weeks with two services on Sundays. When I was young boy I can remember revival services lasting that length of time. I don’t believe that folks today would attend a series of meetings that would last that long … even for someone as famous as evangelist Billy Graham. Note the emphasis on a “Special Lantern Service” entitled “REVIVAL” that is highlighted on the poster. The “Lantern” was a big draw in that day … a multi-media event well ahead of its time. Today’s society has come to expect such multi-media events complete with Powerpoint presentations, sound, video and references to web sites. But in that day the Lantern was quite a novelty. A promotional poster using a little humor to encourage folks to attend the Sykes evangelistic meetings. The electric lantern was used by the Sykes to show slides during their religious services to enhance audience understanding and promote interest in the meetings. Use of the lantern was rather unique for that time and served as an additional draw to encourage folks to attend the special religious meetings conducted by the Sykes. The Sykes wrote a number of hymns and choruses to use in their services. Seth wrote the lyrics and Bessie usually wrote the music. Many of these songs/hymns were published in an evangelists song book, “Songs of Salvation” also known as the S.O.S. songbook, the cover of which can be seen in Figure 5. The S.O.S. 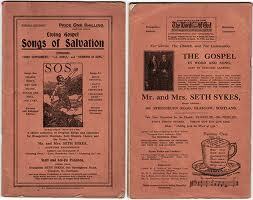 songbook is dated to 1930 by Mr. & Mrs. Seth Sykes, 363 Springburn Road, Glascow. I do not know if the Sykes wrote all of the hymns. Also included in Figure 5. is what I believe to be a one-page resume used by the Sykes to explain their background and promote their services with potential hosts. My cup’s fill’d and running over. My life’s work is telling others. All accounts indicate that many, many people were saved and/or blessed under the ministry of Seth and Bessie Sykes and remember those days fondly. Below are a couple of testimonies in their own words that I located in the public domain of the internet at this link. I am remember the Sykes very well. I lived in Guernsey Channel islands and I remember them coming twice in 1935 and 1937. I am now 76 years old and can still hear Mrs Bessie Sykes powerful voice singing “There were Ninety-and-nine” and “[The Land where the Roses never fade”. Both my parents and some of their friends were saved under their ministry in 1935, and I was saved in 1937. They were wonderful days with we little ones singing “Wonderful, wonderful, wonderful love” also “Thank You Lord for Saving my Soul” The Lantern Slides which they showed as Bessie sang were very real and moving. I have just discovered your correspondence by email. I was born in Springburn, and lived up the same ‘close’ as Molly Weir’s mother. We knew Mrs Weir quite well, and she was so proud of her daughter, Molly. I also played in Paddy’s Park and jumped the ‘midins’ – For many years I was a Gospel singer and was a member of the Garngad Foundry Boys, where my father was treasurer for 40 years (William Robertson). 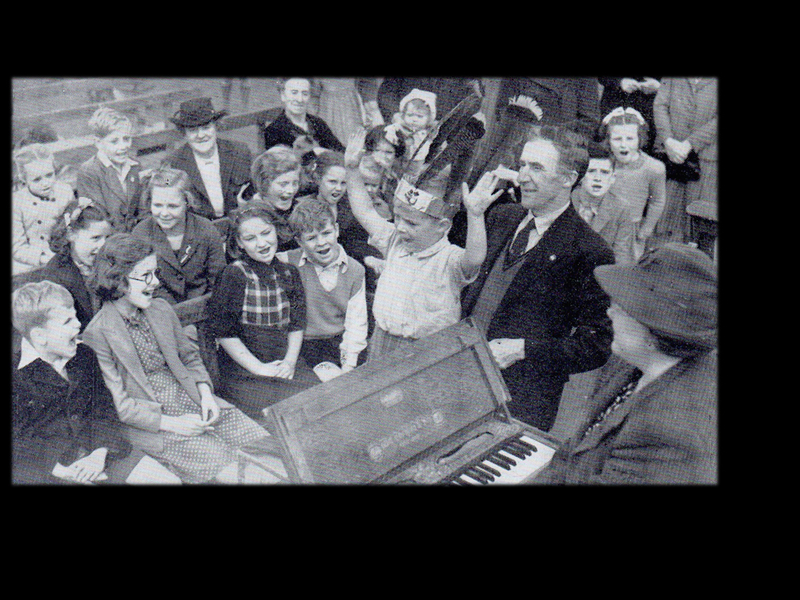 At seveteen I joined the Springburn Gospel Hall. I sang many of Seth and Bessie Sykes songs, and listened to some of her lantern talks, sorry I can’t remember any of them now. They were a most remarkable couple, and have left a legacy of Christian music. Finally, I ran across a blogger, Mark Thompson, who is interested in Scottish history and in particular history related to evangelists from Scotland. 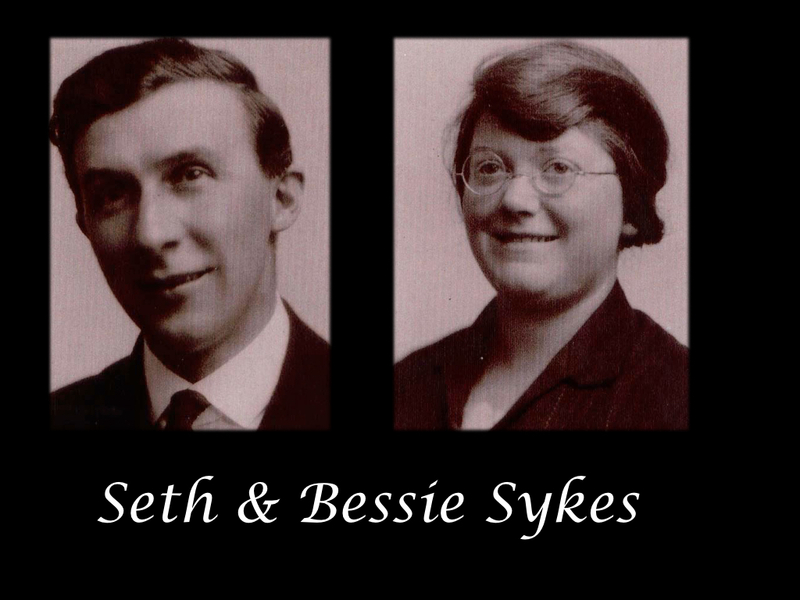 You can read Mark’s blog on Seth and Bessie Sykes at this link. 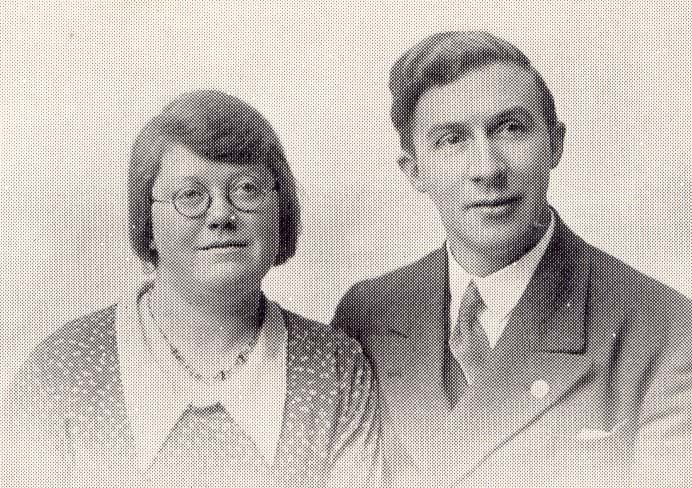 Your comments and contributions to the collective knowledge about Seth and Bessie Sykes are most welcome. Please use the comment section below to communicate with me. Listen to The Good News – includes over 2 hours of southern gospel music recorded by The Good News quartet; once you are there scroll down and click on the tune you want to hear. Share “the good news” from The Good News with your friends. This entry was posted in Bible Studies, Christian Devotions and tagged Bessie Sykes, Christ, Christianity, Evangeline Campbell Sykes, Glasgow, Glasgow Corporation Tramways, God, how can i be saved, Jesus, Magic Lantern, Plan of salvation, Running Over, salvation, Scott Sykes, Seth Sykes, Songs of Salvation, Thank You Lord, Thank you lord for saving my soul, thanksgiving, thanksgiving devotion, Vacation Bible School. Bookmark the permalink. The world was in darkness, in sin and shame. Mankind was lost and then Jesus came. He hung there and died there for you and me. I wish I could find the remaining verses that used to be in the young people’s chorus books when I was a teen. This is the verse that I remember. Hi Jim. I am Seth & Bessie Sykes’ daughter, Eva or Evangeline. I am about to do a presentation about my parents in Guernsey, Channel Islands and came across your blog. Some of what you say is very interesting and encouraging and I would like to use one of the comments in my talk but some of the information you have is inaccurate – especially the pictures. The photo you have of a tramway worker is not my Dad and the other so-called family pictures are not of our family. The lantern shown is a very old model and not at all like the one my parents used. I’m sorry if this sounds critical but there has been so much said about my parents which is just not true – for instance that my mother played a barrel organ. She played a small folding pedal-organ similar to the one Sankey used but smaller and she was a very talented musician. I would be happy to answer any questions if you contact me. Thank you Mrs Campbell, I regret the errors in my article. I will most assuredly correct them in my post. I greatly admire the work of your parents and want to properly represent their ministry. At one point I was in touch with grandson Scott Sykes. We corresponded for some time and as my health continued to fail I let that contact slide. I wrote a follow up article https://jimdavenport.me/2012/07/14/thank-you-lord-for-saving-my-soul-update/ which likely also contains misinformation. As My health has improved lately I would like to correct my posts and would appreciate your help in doing so. 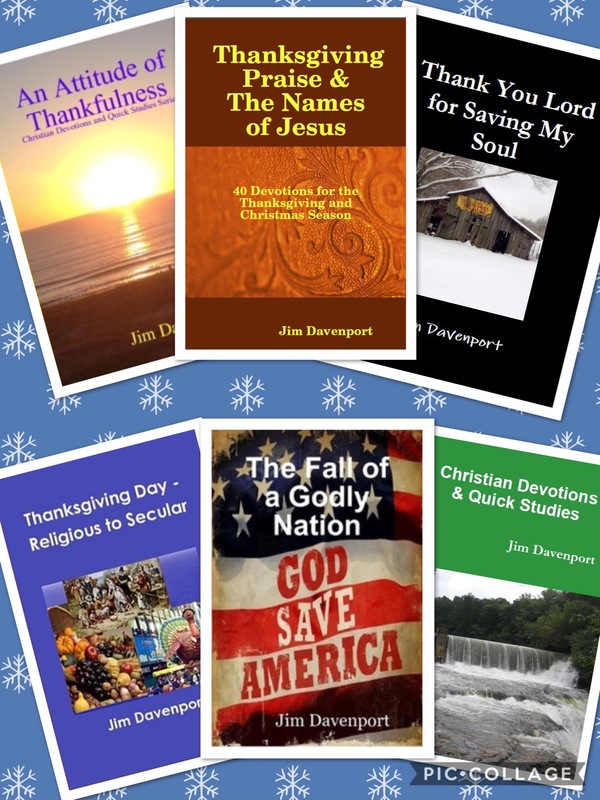 My email address is jamesldavenport@gmail.com. I would appreciate receiving your email in return. Hello Jim. My 98 year old mother is Bessie’s cousin. My mother is now in a care home but remembers Bessie and Seth and used to go to the Bethany Hall in Glasgow to see them. Bessie’s brother Alex was a writer of poetry I don’t know if he had any published, a very talented family. Very interesting post Jim … you have obviously done a great deal of research in preparing this. Thanks for sharing the stories behind the songs and the saints. I also love hearing how your blog has helped you connect with other believers around the world. Keep on sharing the Good News brother! Thanks for reading, Bernie. This song in particular brings back a lot of wonderful memories … especially of my younger life. God continues to use this particular post to reach thousands around the world. Recently I looked at the stats for readers and found that in 2012 folks from 75 countries have read my articles. I have a passion to be Biblically accurate and historically accurate with my writing. I thank you for your encouragement. Keep up your wonderful writing. Jim D.
This message was received via email and I am including it in the comments to preserve it for the future. Thanks Jim, What a great article. I some of these songs as a youth myself.